KNOXVILLE, TN — Tennessee Black Caucus of State Legislators gathered with citizens of the Knoxville community at the Beck Cultural Exchange Center on Saturday, July 22, 2017 to share in the history of Knoxville and to celebrate and honor three local Civil Rights leaders as part of six-part town hall tour of the state of Tennessee. Rev. 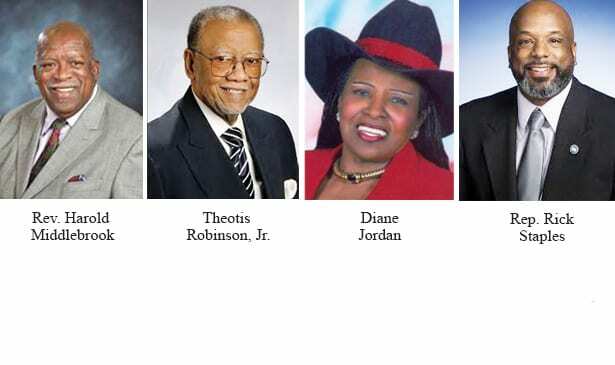 Harold Middlebrook, Theotis Robinson Jr. and Former Knox County Commissioner Diane Jordan were honored at the ceremony by Rep. Rick Staples and other members of the state legislature’s black caucus. After the ceremony honoring Middlebrook, Robinson and Jordan, legislators from the black caucus led an open forum and answered questions from members of the audience. Beck Cultural Exchange Center President Rev. Reneé Kesler explained that the event was an opportunity for community members to engage with local politicians and to see the fruits of community engagement. Middlebrook, Robinson and Jordan, each were honored by having a local bridges renamed after them. The Jackson Avenue ramp and bridge that intersects with Gay Street was renamed to “Rev. Harold Middlebrook Way” to honor Middlebrook and his involvement with the Student Nonviolent Coordinating Committee and Dr. Martin Luther King Jr.
Robinson was honored by renaming the Interstate 40 bridge that passes over 17th Street to “Theotis Robinson, Jr. Pass.” Robinson was one of the first black students admitted to the University of Tennessee in 1961 and served on the Knoxville City Council and as vice president of the equality and diversity for the university. Interstate 275 bridge over Elm Street/Bernard Avenue was renamed to “Diane Jordan Pass” to honor Jordan, who served four terms as the first African-American woman to serve on the Knox County Commission. Robinson Jr. said that he was honored to be recognized for his contributions to Civil Rights in East Tennessee and that the ceremony should be a message to young people about the power of engagement. “It’s an honor, which I appreciate, and it’s great to see so many people out here on a Saturday morning-afternoon to honor not just me but Rev. Harold Middlebrook and Diane Jordan our lives’ work,” Robinson said.